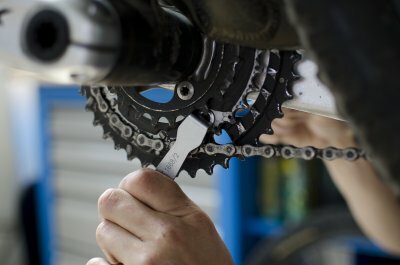 The wrench is used for unscrewing and tightening of front sprocket nuts. The tightening starts with the broader part, and when the nut is sufficiently tightened, it finishes with the narrower part which is bent in order to enable a better power transfer during the final tightening of the nut. When unscrewing the nut, the key is used in the reverse order. The dimension of the hexagonal key opening is SW10. It enables unscrewing and tightening of nuts of this dimension, while at the same time it can be used to hang the key.